Look here for more information about Grandma Moses. Click here and scroll down for five examples of her landscape paintings. Grandma Moses was a self-taught artist who is best known for her brightly colored depictions of farm life and the rural countryside. Her paintings capture the excitement of the first snow, the colors of the seasons, and the spirit of the holidays. The third oldest of ten children, Anna Mary Robertson Moses was born in 1860 on a farm in Greenwich, a small community in upstate New York. Her father, who enjoyed seeing his children express themselves creatively, bought large sheets of blank newsprint paper for them to draw on. What little formal education she had was in a one-room country school. When Anna reached 12 years old, she began doing sewing, cooking, and household chores on a nearby farm for a well-to-do family. At the age of 27, she married Thomas Moses and together they rented a farm in Virginia where they remained for twenty years, raising a family of five children. By 1905, they made enough money to buy their own farm in upstate New York. After her husband died in 1927, she continued to operate the farm with the help of her son. However, when arthritis attacked her hands, she had to give up the farm chores and the embroidery that she loved doing. At the age of 76, she followed her sister's suggestion to try painting. When a local drugstore exhibited her work in the window, an art collector from New York passed by and bought all of her paintings. Upon visiting her, he bought ten more and eventually arranged a one-woman show in New York City. The simple realism and nostalgic quality in her homespun country scenes made her famous at the age of 80. Several months later, a journalist, visiting her hometown, came upon and popularized her local nickname "Grandma Moses." Describing her process, she said, “I paint from the top down. First the sky, then the mountains, then the hills, then the trees, then the houses, then the cattle, and then the people.” Her tiny figures cast no shadows and seem arrested in action. Her use of color relates to the seasons, such as white paint for winter scenes, light green for spring, deep green for summer, and brown for autumn. Working from her memories, she portrayed the way of life that she had once lived. She painted over 1,000 paintings, twenty-five of which she did after her 100th birthday. Grandma Moses was 101 years old when she died in 1961. Become familiar with the life and works of Grandma Moses. 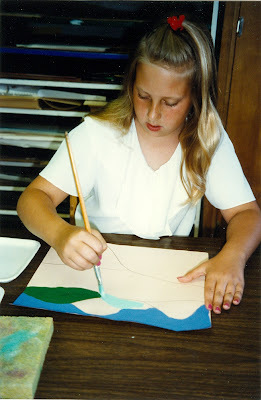 Gather examples of her landscape paintings. Set out pencils and paper. Set out paints, brushes, mixing trays, containers of water, and sponges. Display as many examples of Grandma Moses’ paintings as possible. As the children look closely, tell them about her life and works. In the next several sessions, the children will be painting landscapes, or pictures of the countryside, using Grandma Moses’ style. Discuss the main characteristics of Grandma Moses’ works: she painted from her memories; she divided her paper, painting the sky first, then the hills, then the cattle, and then the buildings and people; her paintings are cheerful and full of bright, pure colors; she used no shadows; and she showed perspective, or distance, by painting objects larger in the foreground (closest to the viewer) and smaller in the background (farthest from the viewer). 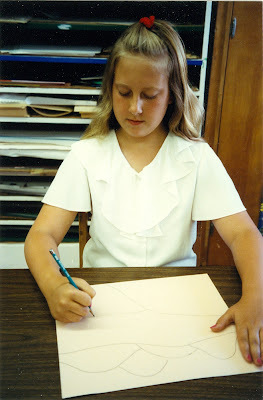 Show the children how to sketch with pencil the basic outline of hills or land for their paintings. Explain to the children that they will need to use different colors or make shades (darkness) and tints (lightness) of the same color to show the different sections of land in the paintings. This can be done by adding blue or black for the darker shades and yellow or white for the lighter tints. Have the children lightly sketch lines to delineate the sky and sections of land on their paper, and then fill in the sections with color. Set out the dried paintings. Set out paints, brushes, mixing trays, containers of water and sponges. 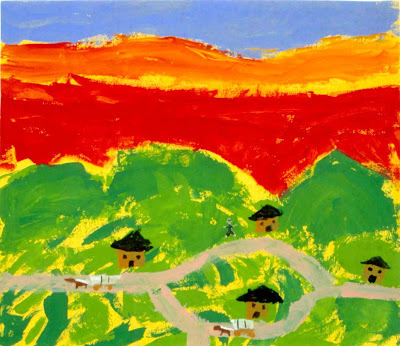 Review Grandma Moses’ style of painting, using bright colors and showing perspective with large and small shapes. 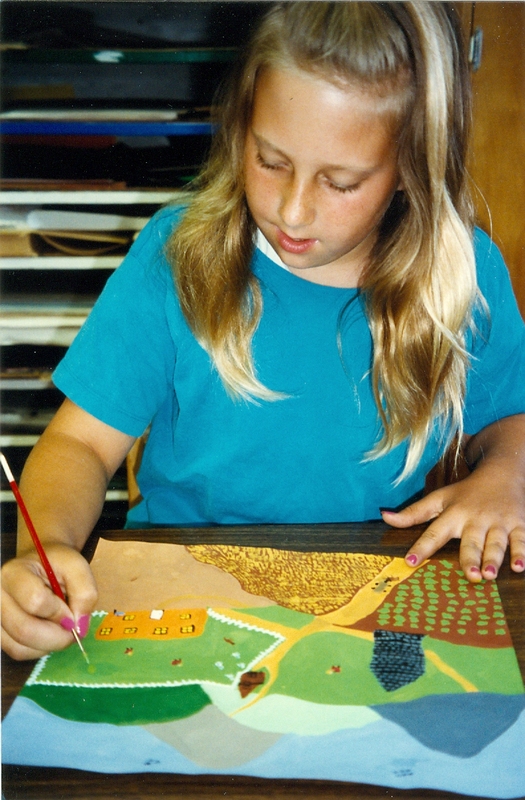 In this session, the children will be making additions to their paintings, such as houses, trees, and people. Explain that these additions can be painted directly on top of the already dried paint. To do this, they should dip their brushes into the paint often to avoid scrubbing with the brush which will cause the bottom layer of paint to become wet and mix with the top color. Emphasize the importance of drying the brush well after rinsing between colors to keep the tempera paints from becoming too watery. Have the children complete their paintings with houses, trees, people, etc. 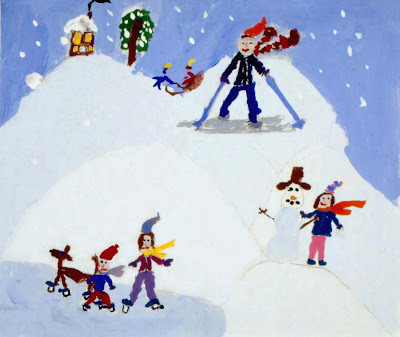 Children enjoy the childlike quality of Grandma Moses’ paintings. Grandma Moses is usually described as either a naive, folk, or primitive artist. Although her work has some characteristics of each, she actually developed her own unique style. When working with younger children, it is good to demonstrate the wet paint over dry paint process. 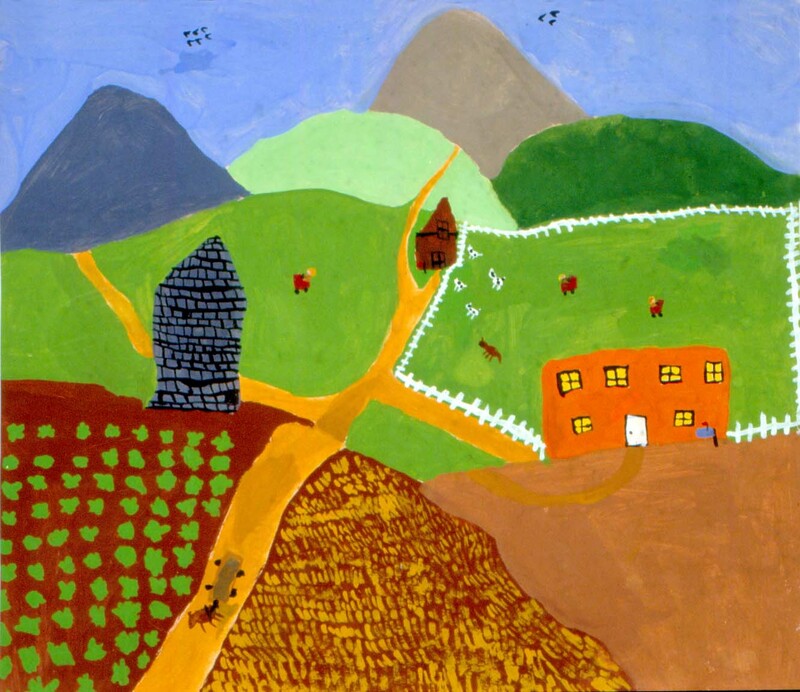 Point out the characteristics of Grandma Moses’ paintings that can be seen in the children’s paintings. Have the children tell how they mixed their paints to delineate the sections of land. Discuss with the children how they felt about painting in Grandma Moses' style. With all this snow, how can I paint ice on the frozen pond for the ice skaters? When I was on vacation in Arizona, I remember seeing hills that were red. If I close my eyes and see covered wagons, can I put them in my painting? A frozen pond will usually reflect the color in the sky, so you might add some blue or gray to the white paint. Grandma Moses would close her eyes to think about things that she had seen and then paint scenes as she remembered them. Covered wagons would make a nice addition to your landscape.